As long as this month exists, we will never be recognized a part of history like we should be. I do not like the idea of Black History Month, Native American Heritage Month, Hispanic Heritage Month or Asian-Pacific American Heritage Month because it's simply saying, to me at least, that you're only important this one time a year. Now that would be a different story if they shared the actual impact each race has had on this country and the world at large on an everyday scale, but it doesn't, so I'm not with it simply put. While the case can be made for each race, I'm speaking solely on my people here today, the African-Americans. There are simply way too many people to name that have made a contribution on this country, and this world on a larger scale. We have done so much for so long that it's crazy to think that we are not celebrated more than we are. Now I'm not saying let's talk about us 247/365, I'm simply saying, tell the history correct. It's now 2015, the internet is a way of life, and we still have a cover over our eyes in terms of American history. We are so quick to point out what Hitler did, we're so quick to point out what North Korea is doing, we're so quick to point out all the terrorist activities around the world, but what about the history that happened right here. Tell the history of the slave ships, of the oppression, tell how just over fifty short years ago, there was still racism running rampant, how they killed all of our heroes and poisoned all of our future leaders. That's my issue with this whole month, you tell the stories of blood thirsty tyrants in other countries and their demise, well tell how there was and still an oppressive system in place for the black man to fail. Tell how there are not any real opportunities to showcase the abilities that we have, other than playing a sport or making a song. That's the story I want to see in the books, being taught on a normal basis. But we won't, but what we will get are cheesy commercials, piss poor segments, and a pat on the head basically. They killed our heroes and leaders and rectify it by making a silly month that doesn't mean much anyway because it's over shadowed by the fact it's Valentine's Day, arguably the fourth most celebrated holiday after Christmas, Thanksgiving and New Year’s. With each passing year, the youth are becoming stronger, smarter and wiser. The amount of technology and secrets slowly coming to light, the youth will be better than every generation before, simply because they are the extension of all the people that have had enough. I do commend my friends and various people on twitter for trying to make the lesser known, but equally important, African-American creators, innovators and leaders known. I'm always excited to learn of something that they did and lead to be impactful on our normal way of life. But yes, that's my beef with Black History Month even that sounds off putting, instead of naming it African-American History Month. One day, just one day, they'll talk about us like we're a part of history on a daily basis, instead of just for a month. Anyone who is settling for just this month is also doing themselves a disservice by allowing them to compact our importance into the shortest month of the year. 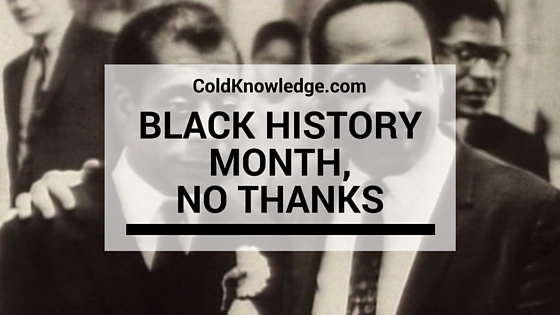 What do you think about Black History Month? Like it, don't like it? Let me know in the comments below.